Represent your favorite NFL, AFL, or other football team with our custom molded 21 oz. football glasses! 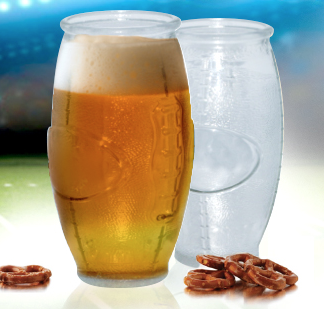 With a texture that looks and feels just like a real pigskin, these glasses provide a fun and functional way to enjoy your favorite brew or other beverage. Sports bars, restaurants, stadium lounges and more will love to apply their logo on one of the two available printing areas. Contact us today for this great gift and souvenir piece!